More and more businesses are choosing to go paperless. This is a great decision that can save you time and money, reduce storage space requirements, and make a positive impact on the environment. The first step to this process is choosing a good scanner. This page will help you make an informed decision and find the scanner that best fits your particular requirements. 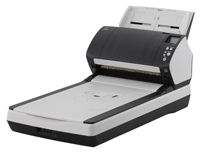 While there are dozens of scanner brands and hundreds of document scanner models out on the market, they can all be divided into a few general types. Flatbed - This is what most people outside of the industry think of when they hear the word "scanner". Similar to copy machines, this type of scanner includes a large pane of glass upon which you place the item to be scanned while an imaging element moves back and forth beneath it, forming a digital image. This type of scanner is most useful for scanning a few bound, thick, delicate, or untraditionally shaped items, since the item being scanned merely sits on the glass and does not move while the imaging element passes below it. However, the scanning process is relatively slow, both because the imaging element must be moved mechanically and because you can only scan one side of one item at a time, manually flipping and switching out the contents between each scan. Flatbeds also tend to be bulky, since the glass must be large enough to accommodate the full length and width of the document and be oriented horizontally on a flat, level surface, taking up a lot of desk space in the process. Automatic Document Feeder (ADF) - This type of scanner often resembles a printer or fax machine, with an input tray at the top and an output tray at the bottom. Unlike a flatbed, it is the document that moves across the imaging element of an ADF, rather than the other way around. This allows for an entire stack of documents to be pulled through in quick succession, ranging in speed from less than a dozen to a couple of hundred pages per minute. 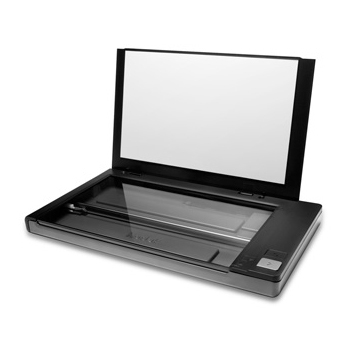 Because the glass in an ADF is a narrow strip, as wide as the widest allowable page size but less than an inch long, the scanner can be much smaller and lighter than a flatbed, thereby minimizing required desk space, reducing the shipping cost, and facilitating installation and portability. In many models, two of these smaller imaging elements can be included on opposite sides of the same machine, thus allowing both sides of a page to be scanned in a single pass, doubling the overall scanning speed for double sided documents. However, feeders have a limit on the thickness, width, and shape of documents that can be pulled through. There is also the possibility of paper jams and doublefeeds, although these problems tend to be more common with cheaper, lower quality scanners. Flatbed/ADF Combo - This is exactly what it sounds like - a unit that combines a flatbed and an automatic document feeder into one machine. While this still takes up as much desk space as the flatbed, and is usually heavier and bulkier to ship, it can quickly scan stacks of documents while still allowing thicker or bound items to be scanned on the same machine and with the same software. An alternative solution would be to get a tethered flatbed, which connects to the computer through the ADF and uses the same driver and software. Wand / Bar - Combining the narrow glass of the ADF with the one-sided scanning of the flatbed, these small, hand-held devices are the most portable type of scanner. They do not have any moving elements at all, instead requiring a person to pass them over the top of the page by hand. The data is recorded to either built-in internal storage or a to a small external storage, such as USB drive or SD card. It can later be transferred to your computer via the external storage or, in some cases, by a USB cable or Wi-Fi connection. While very convenient for on-the-go scanning, swipe scanners require a steady hand and tend to have fewer features than their larger, more expensive counterparts. 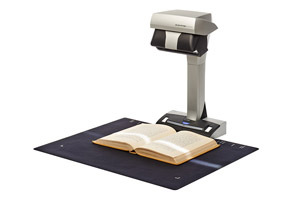 Book - Similar to a flatbed, this scanner can only scan one image at a time. However, instead of having an imaging element that moves under glass, it instead has a long-distance imaging element that is held by a vertical arm over the item being scanned. This allows for bound items, such as books, to be scanned without flattening or unbinding them. More advanced models even have accessories to turn pages automatically or software features to correct for the curvature of the pages below. All-in-One - These machines include some combination of features from flatbed scanners, ADF's, printers, copiers, and fax machines. While convenient for replacing all of these myriad devices with one, these bulky units tend to lack the quality and features of machines that just do one job well. They are also often more difficult to set up and tend to break down more frequently. Because of this, ScanStore does not carry any all-in-one machines, focusing on quality over versatility. Flatbed - This is what most people outside of the industry think of when they hear the word "scanner". Similar to copy machines, this type of scanner includes a large pane of glass upon which you place the item to be scanned, while an imaging element moves back and forth beneath it, forming a digital image. This type of scanner is most useful for scanning a few bound, thick, delicate, or untraditionally shaped items, since the item being scanned merely sits on the glass and does not move, while the imaging element passes below it. However, the scanning process is relatively slow, both because the imaging element must be moved mechanically and because you can only scan one side of one item at a time, manually flipping and switching out the contents between each scan. Flatbeds also tend to be bulky, since the glass must be large enough to accommodate the full length and width of the document and be oriented horizontally on a flat, level surface, taking up a lot of desk space in the process. For each type of scanner, there are numerous models out on the market. The various manufacturers tend to focus on different market segments, with their scanner selections varying in price, quality, and features. ADF's have a standard set of features to choose from, which are listed below. Simplex / Duplex - The difference between these two terms is that Simplex scanners only scan one side of a page at a time, while Duplex scanners can scan both sides in a single pass. This reduces scanning time, since you don't have to scan each stack of double-sided documents twice, and can always be turned off when scanning single-sided batches to avoid blank pages. Speed - This is the rate at which the scanner pulls through and digitizes documents. There are two speed ratings - PPM (Pages Per Minute) and IPM (Images Per Minute). For Simplex scanning, these are equal, so only PPM is used. Duplex scanning pulls through pages at the same rate, but you get two images for every physical page - one for each side of the page - so IPM is used. Although duplex scanning may slightly increase processing time, depending on your computer, this is usually so negligible that the duplex speed is always written as double the simplex speed. Max Page Size - This represents the largest page size a scanner can accept. There is a hard limit on the width of a page, since it must physically fit through the scanner, but there is usually also a limit on the length of a page, since the scanner can only buffer so much information before it runs out of memory. Most document scanners come in widths of 8.5", 11", or 12", matching common paper size standards, but they can all scan smaller documents, too, usually down to 2" square. Max Page Thickness - This represents the thickest paper stock that can safely go through the scanner. Paper thickness can be given in weight or fractions of length. Standard page thickness is usually about 20lb., but some scanners are more versatile than others, being able to feed through anything from onion skin to card stock. A few can even feed through embossed plastic ID cards. Feeder Capacity - This is how many pages of standard paper thickness can fit into the input tray at any one time. This value is important to know how often you will need to add more documents when scanning large batches, which in turn affects overall scanning time. The rating depends on thickness and is usually for 20lb paper stock. The thicker the paper, the fewer sheets will fit. Daily Duty Cycle - This is a manufacturer estimatated maximum number of pages that a scanner can scan in any one day before it begins wearing out. This is not a hard limit, so it will continue scanning beyond this point, but it is not recommended to exceed it too often. Some scanners give a warning message when the limit is reached, but not all do. Even if the scanner is used to scan fewer pages per day than this limit, it is recommended to clean the scanner of dust and wipe down the rollers with specialized cleaning supplies every time this cycle is cumulatively reached. Bitonal/Greyscale/Color - Although there are still some models that can only recognize bitonal (black & white) information, most modern scanners can scan in color or greyscale as well. Color Detection - This automatically detects whether the page should be scanned in black & white or in color, based on the contents of the page, even for different pages in the same batch. Multi-Image Output - Some color scanners have the ability to scan a page in color, greyscale, and black & white at the same time, resulting in three different files for every page. Color Dropout - This allows the scanner to ignore a particular color, making it invisible in the resulting file. This is used for scanning specially designed forms to increase recognition accuracy. Multifeed Detection - Scanners that have this feature are able to sound a warning when more than one page goes through at a time, preventing some pages from slipping through and not being digitized. Basic multifeed detection is mechanical, with the number of sheets being measured by the distance between two rollers. Ultrasonic multifeed detection is more accurate, using sound waves to check for spaces between multiple sheets as they pass through the scanner. Staple Detection - This detects staples before they go through the scanner, preventing possible scratches on the glass or other damage to the scanner. It does not remove the staples, as that is a completely different feature reserved for only the most advanced scanners. Autocropping - Also called "size detection" or "edge detection", this allows the scanner to automatically crop around the edges of the page without the user having to enter the page size manually. This prevents the ugly blank borders or manual cropping during post-processing. Deskew - This automatically fixes slight tilting or skewing of the page that sometimes happens as it is pulled through the scanner. This makes the resulting scan look neater and improves recognition accuracy when using Optical Character Recognition or Forms Processing software. Autorotate - Also called "Automatic Orientation", this allows the scanner to orient the page right-side up based on the text. It rotates the page in 90° increments, allowing landscape oriented pages to be mixed in with portrait oriented pages and removing the need for manual correction. Blank Page Removal - This automatically removes blank pages from a batch, reducing file size. Imprinter / Endorser - Some scanners can accept an optional imprinter unit, which is usually sold separately. Imprinters are like small printers that print a single line of sequence characters on pages that go through the scanner, such as for bates stamping. There are two types of imprinters: pre-scan imprinters (also known as just imprinters) that print before the page is scanned, so the characters show up in the scan, and post-scan imprinters (also known as endorsers) that print after the scan, so that the characters do not show up in the scan. There are some software that offers digital imprinting, which does the same thing but without expensive equipment or ink. Interface Type - This is how the scanner communicates with the computer. Most modern scanners use USB 2.0 or 3.0 connections, but there are still some that use Firewire and SCSI. Operating System - This shows which operating systems the scanner is compatible with. Scanner drivers can only be installed on certain operating systems, whether the difference is between Windows vs. MacOS or older versions of these operating systems vs. newer ones. TWAIN / ISIS - These are the two most common scanner drivers, which allow the scanner to be recognized by scanning software. Different software look for different drivers, but most scanning applications will at least recognize the TWAIN driver. If a scanner does not have either of these, it probably works with a proprietary driver and will only be recognized by the software that it comes bundled with, so you won't be able to scan directly into any software you purchase separately. VRS - This shows whether the scanner includes "Virtual Rescan" software, which digitally improves the image quality of the scan, sometimes above and beyond the original document. Bundled Software - In addition to the scanner driver, most scanners also come with some combination of software included with your purchase. There is usually a basic scanning software to get your started, but occasionally it includes a simple document management application, OCR software, and image enhancement, among others. Warranty - Scanners usually come with a limited manufacturer's warranty that covers equipment malfunctions and manufacturer defects. These warranties range from around three months to as much as three years, and they can be extended with service contracts, when available. A good warranty can be worth a higher cost of the scanner, because it will cover all parts, repairs, and occasionally even maintenance that would otherwise cost additional money and hassle. A longer warranty is also representative of the amount of faith a manufacturer has in the scanner's reliability. Once your warranty expires, it is recommended to extend it with a service contract as soon as possible, because a scanner that breaks out of warranty cannot be placed back under warranty until it is fully repaired by an authorized technician at the owner's expense. The difference between these two terms is that Simplex scanners only scan one side of a page at a time, while Duplex scanners can scan both sides in a single pass. This reduces scanning time, since you don't have to scan each stack of double-sided documents twice, and can always be turned off when scanning single-sided batches to avoid blank pages. This is the rate at which the scanner pulls through and digitizes documents. There are two speed ratings - PPM (Pages Per Minute) and IPM (Images Per Minute). For Simplex scanning, these are equal, so only PPM is used. Duplex scanning pulls through pages at the same rate, but you get two images for every physical page - one for each side of the page - so IPM is used. Although duplex scanning may slightly increase processing time, depending on your computer, this is usually so negligible that the duplex speed is always written as double the simplex speed. This represents the largest page size a scanner can accept. There is a hard limit on the width of a page, since it must physically fit through the scanner, but there is usually also a limit on the length of a page, since the scanner can only buffer so much information before it runs out of memory. Most document scanners come in widths of 8.5", 11", or 12", matching common paper size standards, but they can all scan smaller documents, as well, usually down to 2" square. This represents the thickest paper stock that can safely go through the scanner. Paper thickness is rated in units of weight or fractions of length. Standard page thickness is usually about 20lb., but some scanners are more versatile than others, being able to feed through anything from onion skin to card stock. A few can even feed embossed plastic ID cards. This is how many pages of standard paper thickness can fit into the input tray at any one time. This value is important to know how often you will need to add more documents when scanning large batches, which in turn affects overall scanning time. The rating depends on thickness and is usually rated using 20lb paper stock. The thicker the paper, the fewer sheets will fit in the feeder without jamming. This is a manufacturer estimatated maximum number of pages that a scanner can scan in any one day before it begins wearing out. This is not a hard limit, so it will continue scanning beyond this point, but it is not recommended to exceed it too often. Some scanners give a warning message when the limit is reached, but not all do. Even if the scanner is used to scan fewer pages per day than this limit, it is recommended to clean the scanner of dust and wipe down the rollers with specialized cleaning supplies every time this cycle is cumulatively reached. Although there are still some models that can only recognize bitonal (black & white) information, most modern scanners can scan in color or greyscale as well. In the latter case, you can always choose which of the three modes the scanner scans in. This automatically detects whether the page should be scanned in black & white or in color, based on the contents of the page, even for different pages in the same batch. Some color scanners have the ability to scan in color, greyscale, and bitonal simultaneously, resulting in three different files for each document. This allows the scanner to ignore a particular color, making it invisible in the resulting file. This is used for scanning specially designed forms to increase recognition accuracy. Scanners that have this feature are able to sound a warning when more than one page goes through at a time, preventing some pages from slipping through and not being digitized. Basic multifeed detection is mechanical, with the number of sheets being measured by the distance between two rollers. Ultrasonic multifeed detection is more accurate, using sound waves to check for spaces between multiple sheets as they pass through the scanner. This detects staples before they go through the scanner, preventing possible scratches on the glass or other damage to the scanner. It does not remove the staples, as that is a completely different feature reserved for only the most advanced scanners. Also called "size detection" or "edge detection", this allows the scanner to automatically crop around the edges of the page without the user having to enter the page size manually. This prevents the ugly blank borders or manual cropping during post-processing. This automatically fixes slight tilting or skewing of the page that sometimes happens as it is pulled through the scanner. This makes the resulting scan look neater and improves recognition accuracy when using Optical Character Recognition or Forms Processing software. Also called "Automatic Orientation", this allows the scanner to orient the page right-side up based on the text. It rotates the page in 90° increments, allowing landscape oriented pages to be mixed in with portrait oriented pages and removing the need for manual correction. This automatically removes blank pages from a batch, reducing file size. Some scanners can accept an optional imprinter unit, which is usually sold separately. Imprinters are like small printers that print a single line of sequence characters on pages that go through the scanner, such as for bates stamping. There are two types of imprinters: pre-scan imprinters (also known as just imprinters) that print before the page is scanned, so the characters show up in the scan, and post-scan imprinters (also known as endorsers) that print after the scan, so that the characters do not show up in the scan. There are some software that offer digital imprinting, which achieves the same goal as an imprinter, but without expensive equipment or ink. This is how the scanner communicates with the computer. Most modern scanners use USB 2.0 or 3.0 connections, but there are still some that use Firewire and SCSI, among other methods. This shows which operating systems the scanner is compatible with. Scanner drivers can only be installed on certain operating systems, whether the difference is between Windows vs. MacOS or older versions of these operating systems vs. newer ones. These are the two most common scanner drivers, which allow the scanner to be recognized by scanning software. Different software look for different drivers, but most scanning applications will at least recognize the TWAIN driver. If a scanner does not have either of these, it probably works with a proprietary driver and will only be recognized by the software that it comes bundled with, so you won't be able to scan directly into any software you purchase separately. This shows whether the scanner includes "Virtual Rescan" software, which digitally improves the image quality of the scan, sometimes above and beyond the original document. In addition to the scanner driver, most scanners also come with some combination of software included with your purchase. There is usually a basic scanning software to get your started, but occasionally it includes a simple document management application, OCR software, and image enhancement, among others. Scanners usually come with a limited manufacturer's warranty that covers equipment malfunctions and manufacturer defects. These warranties range from around three months to as much as three years, and they can be extended with service contracts, when available. A good warranty can be worth a higher cost of the scanner, because it will cover all parts, repairs, and occasionally even maintenance that would otherwise cost additional money and hassle. A longer warranty is also representative of the amount of faith a manufacturer has in the scanner's reliability. Once your warranty expires, it is recommended to extend it with a service contract as soon as possible, because a scanner that breaks out of warranty cannot be placed back under warranty until it is fully repaired by an authorized technician at the owner's expense. Now that you know the many different features to look out for in a scanner, it may seem daunting to choose one with the right combination of these features to fit your specific requirements. However, some of these are more important to consider first, considerably narrowing down your options and making your choice that much easier. First, start by looking at scanners that are compatible with your computer's operating system (Windows or MacOS). If you are limited to using only a Mac or only a PC, or if you need a scanner that is alternately compatible with both, you can narrow your selection pool by half or more. Be sure to check the scanner's brochure to make sure that your operating system's version number is also supported, since a driver might not be compatible with some operating system verions, even if it is compatible with others of the same kind. Some manufacturers offer updated drivers for recent scanner models on their websites, but older scanners will eventually stop being supported in favour of newer models. Second, find out the type of documents you will be scanning. Will all of your documents be standard A4 (8.5 x 11") printer pages, or will you have larger page sizes or documents with non-standard thickness? Will all of your documents be loose-leaf or will some be bound and require a flatbed or other feeder alternative to scan? Will you be scanning black & white text, or will need the ability to scan in color or have mixed batches that would benefit from color detection. Make sure that the scanner can accept the full variety of your documents, and throw out of consideration those that can't. Third, calculate or estimate how many pages you plan on scanning per day and how much time you plan on spending on this process. This will give you a good starting point to figuring out the speed and daily duty cycle range that you should be looking in. Although there is some correlation between these two specs (faster scanners usually have higher daily duty cycles), some models are more robust than others of the same speed. Keep in mind that feeder capacity also plays into overall scanning speed and expense, particularly in the case of large scanning projects, since changing out batches takes additional time and labor. If you need your documents properly named, organized, or even indexed on your computer, you may want to invest in the proper document management or forms processing software to speed things along. In this case, make sure your scanner has the drivers to support these. Finally, compare the remaining choices. The above-mentioned considerations should have narrowed down your choices and given you an idea of the price range that you are looking at. Variations in price may depend on brand, which is a double-edged sword in that you may have to pay more for a better known name, but those may be better known because they produce higher quality scanners and offer better support. As with any important purchase, you want to make sure that you are getting the most bang for your buck and that the company will exist to support it for the lifetime of your investment. First, visit the scanners page on ScanStore or search below to see the types and features available. Second, contact a ScanStore representative that can help answer any questions you might have. Third, purchase the scanner that best fits your needs and begin the process of going paperless today! I would like to scan a document, then fill or type in the blanks. Will OCR software allow me to do this? Please let me know if the price stated in the Web site in US$ dollars? Is it safe to use my credit card on ScanStore.com? How do you protect my information? What is your return policy? If the product has a problem on delivery how do you handle that?